We, at Glocal University, believe in nurturing practical skills and talent than binding theoretical concepts. School of Business and Commerce, Glocal University, continuously engages with industry to provide the students a vigilant realistic business environment to learn, grow and develop as dynamic professionals. Our students are highly zealous and active to learn and perform at the same time. 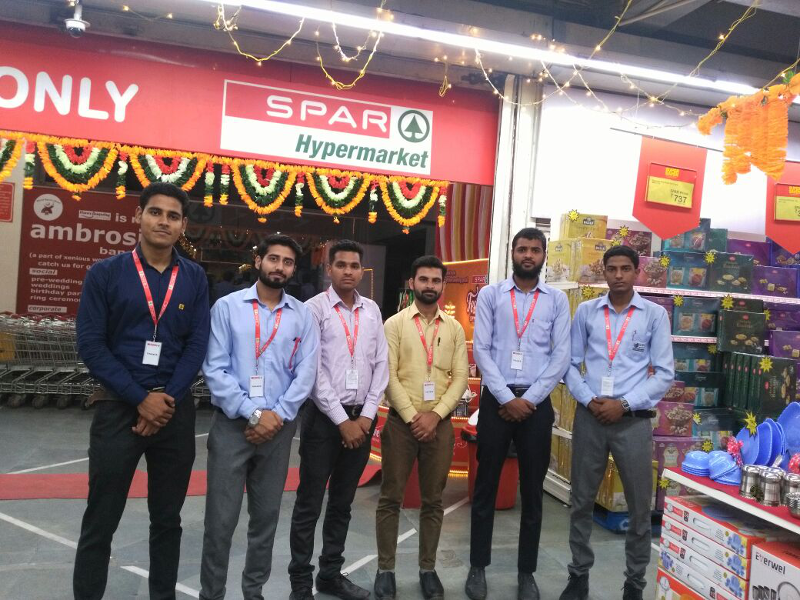 Recently, six MBA students (2016-18 batch) joined a 6 week live project ‘Corporate Gifting’ at Spar Hypermarket India Pvt. Ltd., Noida operated by Max Hypermarket, a subsidiary of Landmark group, in India. SPAR is the world’s largest food retailer in the world, Headquartered in Amsterdam (NETHERLAND). It has footprints in 42 countries in 4 continents with turnover of 3198 billion Euros. It has independent voluntary chain of 13,000 stores and serving 1 crore customers daily. In India, it has 18 stores across the country. The project was a B-2-B assignment, specifically to contact and cater corporate clients. The students learnt aspects like Product Catalogue building, knowledge categorization of products into department, discount slab, sample presentation and deal closure. Direct interaction with senior executives of industry helped the students enhance their decision-making and analytical ability. The project also provided a great learning on corporate discipline, competitive bottle-necks and grooming. The students covered colleges, universities, hospitals, e-commerce industries, traders, manufacturing facilities and service agencies of Delhi, Ghaziabad, Sahibabad, Noida, Gurgaon and other nearby areas. The project helped in realizing the real challenges of corporate world, professional development and learning for all future endeavors.